Phil Sauter, President of PMS Microdesign, Inc. and Ravi Reddy, an academic psychiatrist at the Western Psychiatric Institute at the University of Pittsburgh Medical Center are collaborating on the potential of utilizing virtual reality technology for education in a wide range of settings, as well clinical problems suitably addressed by the application of VR methods. Building on the success of the Virtual Schizophrenia Software developed by PMS Microdesign, Inc. and the influence of new 3D Gaming technology PMS Microdesign, Inc. has launched a new software development effort to expand the availability of virtual reality technology. A new Web based virtual reality application has been developed to push the envelope of virtual reality technology. The new simulation software has four options for expanded flexibility. 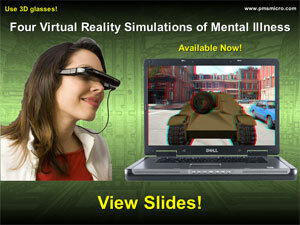 Two simulations are available in a single virtual reality application, the first is a simulation similar to the Virtual Schizophrenia that places the patient in a single location, in this case on a city street, and simulates the visual and auditory hallucinations of a patient with mental illness. The second simulation utilizes a revolutionary new technique that enables the patient to move within a three-dimensional environment greatly improving realism and flexibility. This new application can be implemented using a low cost head mounted display and can be viewed from the Web, CDROM/DVD on desktop and notebook computers, for purchase or rental and is now available. To improve the usability of the software, each of the two simulations have two resolution modes. A low detail mode for computers with limited 3D graphic capability and a high detail mode for the best quality. As a patient with mental illness you find yourself on a street corner opposite a police officer you think is out to get you but you must walk three blocks to the drug store to pick up your prescription. 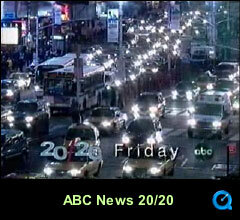 As you approach the busy intersections you must stay focused on your goal to arrive safely at the drug store. The problem is that everything on the street is a possible distraction of hallucinatory images and voices that will prevent you from achieving you goal. Like on a real city street you must pay attention to the traffic signals and only cross the street when the walk signal are illuminated. Now step into the world of a patient with mental illness. A full version of the software runs in your browser and is available by clicking the above image. 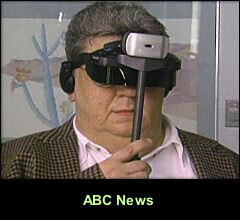 The software will run in your browser window but for full immersion a head mounted display is recommended. Connecting our new head mounted display to the computer is as simple as plugging it into the video, audio and USB ports. (c) 2007 PMS Microdesign, Inc.